These results were challenged by the Ownership Foundation which cast the Drewson findings as anti-wealth hogwash. "We'll be reaching out to our various alumni soon, and start pulling on the purse-strings of Drewson's endowment. Before long this study will disappear," remarked Cynthia Feelgood of the Foundation's inner sanctum with amazing alacrity. Many belief systems are hardly related to food-economics, but simply to in-group out-group dynamics; which is an attempt to pass on one group's genes at the expense of another. The graduate-study found parallels to many recent changes in our own society. They found examples of intolerant in-group dominated societies interrupted by lowered dynamism among the elites and expansion to more tolerant out-group societies in which genetic infusion was not only tolerated but welcomed. 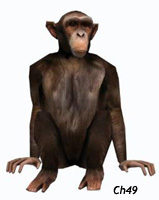 These societies were usually undergoing decline, in search of cheaper labor, and often collapsed afterwards The main difference between Human and Chimp economics, is that within Chimp groups the dominant will take as many nuts as they can until they are satiated then will not care what happens to the remainder. In human societies the dominant elite will try to keep the remaining surplus into death and beyond both with elaborate pyramids and negligible estate taxes. The question still remains how many graduate students does it take to write Shakespeare, or turn on a light bulb?